My daughter is a huge Twilight Saga fan. She has read all the books and owns all the movies that are out as of yet. 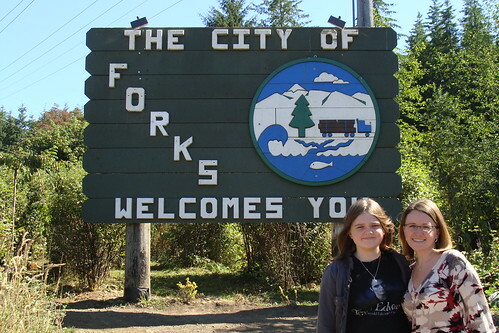 To celebrate T’s 13th birthday I took her to Forks, Washington for the ultimate Twilight Saga experience. I wanted to make sure I planned for us to see all the sights within our allotted time in Forks so I did a lot of research leading up to our trip. Below is a list of must do steps for planning the perfect Twilight trip to Forks, Washington. Forks, WA Chamber of Commerce offers a lot of very useful information on their website including directions on how to get to Forks. Traveling to Forks from the closest International Airport, which is near Seattle, takes roughly four hours and includes a Ferry ride. After calculating flight time and travel time from the airport to Forks it makes for a long day so make sure you plan accordingly. There are various lodging options available when staying in Forks, WA. Of course for the ultimate Twilight Saga experience I recommend staying at the Cullen House or sleeping in the Bella Suite at the Dew Drop Inn. By requesting a Twilight Saga Travel Guide from the Forks Chamber of Commerce via email they sent me an amazing packet. The packet included a few different brochures of the town, a Forks, WA Map with real photos of each Twilight location and really fun Twilight trivia questions based on the books. The map was great for finding our way around the town. On the Forks Chamber of Commerce website you can download their 5 Day Travel Guide in PDF which gives you ideas of places to visit while in Forks, Washington although they aren’t all Twilight related. Since we traveled all the way from Texas we wanted to make sure we scheduled in some time to visit the gorgeous Hoh Rain Forest. In the guide you can read more about the surrounding areas and sights to see. Double check the hours of operation for the Forks Chamber of Commerce before leaving on your trip. During the summer months they are open until 5:00 PM which was important for us to make sure our flight schedule allowed us enough time to arrive before they closed. The Chamber of Commerce allows Twilight Fans/Visitors to place a pin on a map of where you are visiting from. This is a lot of fun to take part in and be able to see where everyone has visited from across the world. If you hadn’t requested your Twilight Saga Travel Guide from the Chamber of Commerce beforehand this is also when you can pick one up and use the map to find all the Twilight locations to visit. Be ready with your camera when you arrive because at this location you will take photos of Bella’s old red truck outside. A few of the Twilight Saga sights are not actually in Forks, Washington. The dress shop, book store and restaurant that Bella and Edward first ate at are all located in Port Angeles, WA which is a little over an hour away from Forks. The restaurant, Bella Italia, is only open for dinner so I recommend visiting the bookstore and dress shop on your way out for dinner one evening. I also highly suggest you make reservations at Bella Italia, it’s a local favorite and we had to wait two hours to be seated. Depending on when your flight home from Seattle is scheduled you could possibly do this on your way out of town. Otherwise make sure your travel arrangements allow for you to be away from Forks for half a day or at least the whole evening and not miss anything. If you plan to take a Twilight Tour through Forks, Washington then you may want to try the only exclusive company that is allowed to travel as a tour company onto Jacob’s homeland: the Quileute Nation of La Push, Team Forks. They have three different tours available all taking you along in the Twilight themed tour bus. Randy is an amazing tour guide, if I must say so myself. Other various sights to add to your check-list: Swan House, Cullen House, Forks Community Hospital with Dr. Cullen’s Parking Spot, Forks Police Station with Charlie Swan’s uniform in display case, Forks High School and Forks Outfitters. I was just wondering who won the twilight giveaway?? thanks and happy new year!